God Bless America God Bless the USA! In the TV commercials they call it "an army of one," and the phrase is intended to send a message: in the U.S. armed forces, every person counts. If you take a round, your buddies will come and get you. "The Ranger creed is that you do not leave a fallen comrade on the field of battle," says David Anderson, of Jacksonville, Fla., a former Ranger whose son, Marc Anthony Anderson, followed him into the Army. "I really believed in what the creed says, and Marc did. He said, 'If something happens to me, don't worry, because you'll have a body.'" Last week Marc's body, along with those of seven other American soldiers, was flown from Afghanistan to Ramstein Air Force Base in Germany before coming home for those proud, sad ceremonies that mark the death of young men in battle. The Army had once more been asked to live up to the promise it makes to those who serve. "We don't leave Americans behind," says Brigadier General John Rosa Jr., deputy director of operations for the Joint Chiefs of Staff. Last week that word was kept. But the price for doing so was high. For weeks U.S. forces had been watching as Taliban and al-Qaeda fighters gathered south of Kabul. Code-named Operation Anaconda, the battle plan aimed at this force was a hammer-and-anvil strategy. Friendly Afghans, assisted by U.S. special forces, would flush the enemy from the north and northwest toward three exits of the Shah-i-Kot valley, where American troops waited. To the south, battle positions Heather and Ginger were divided by a hill christened the Whale, while to the east, battle position Eve guarded escape routes over the high mountains to Pakistan. But after two days of fierce combat, the al-Qaeda and Taliban fighters were still in place; one American had already been killed. Before dawn on Monday, two huge MH-47 Chinooks, double-headed flying beasts like something out of Tolkien, chugged through the frigid air. They were on their way from Bagram air base, north of Kabul, to Shah-i-Kot and the most intense battle so far of the Afghan war. A force that would eventually grow to more than 1,000 Americans, drawn mainly from the 10th Mountain and 101st Airborne divisions, together with Afghan militias and about 200 special forces from allied nations, was engaged with perhaps 1,000 al-Qaeda and Taliban fightersfour times as many enemy men as the U.S. had expected. The battlefield spread over 70 sq. mi., at altitudes that ranged from 8,000 to 12,000 ft. and temperatures that dipped at night to 15�F. The Chinooks headed for Ginger, at the southeast corner of the valley, where American forces had met intense opposition two days before. As the choppers prepared to set down, they came under heavy fire from small arms and rocket-propelled grenades, one of which bounced, without exploding, off the armor of a Chinook. In the same bird, a hydraulic line was cut, and the pilots radioed back to Bagram that continuing with the mission would be suicide. Major General Frank (Buster) Hagenbeck, the force commander, agreed, and the choppers veered away to the north, climbing steeply. They found a place to set down and did a head count. On the damaged Chinook, one man was missing. They counted again. Navy SEAL Neil Roberts, the rear gunner who had been returning fire from the open back hatch, was no longer with his team. Roberts had apparently been jolted out when the chopper banked hard to the north. The Rangers radioed Bagram for permission to go after their man. Hagenbeck agreed, and the undamaged Chinook dropped off six commandos to search for Roberts; then both helicopters returned to base. Unmanned surveillance aircraft searched for the missing man and found him moving across the valley. Images beamed from the drones to video monitors at Bagram showed three men approaching Roberts. They were at first thought to be friendly. Then Roberts was seen trying to flee. About three hours after the first incident, two more Chinooks set off from Bagram on a dual mission: to rescue Roberts and to insert more troops at Ginger. One of the choppers took heavy machine-gun fire. It shuddered and spiraled toward the ground but managed to crash-land less than a mile from the place the first pair had come under attack. As the troops clambered out of the wrecked MH-47, they were ambushed. Hagenbeck ordered AC-130 gunships to the battle to provide close air support, but the al-Qaeda barrage was so intense that U.S. troops couldn't be lifted out during daylight. Fighting continued through the day, as the first team searching for Roberts fought its way to the downed Chinook. It was not until midnight that the last U.S. soldier was evacuated. 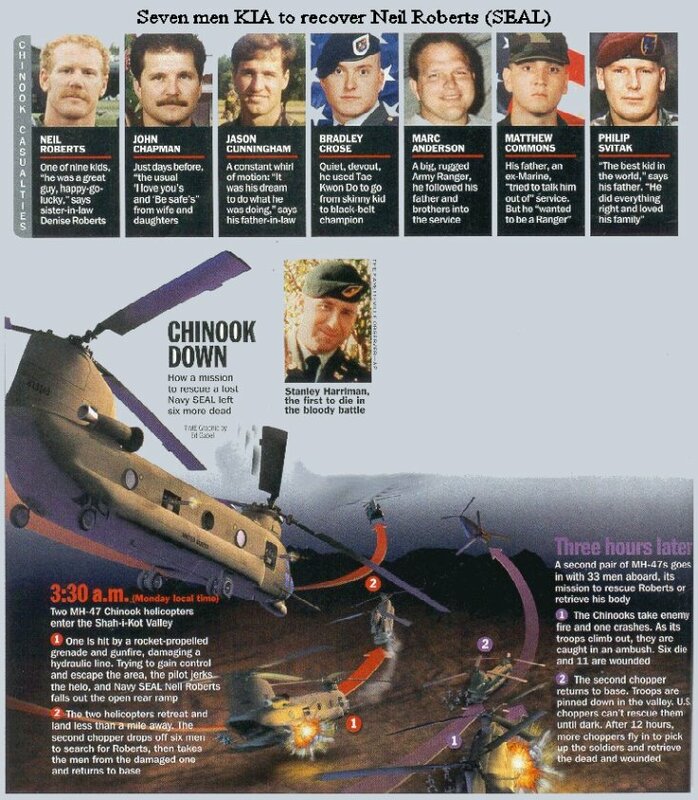 The choppers also carried 11 wounded and the bodies of seven Americans Roberts and six of his would-be rescuers. Roberts had died at the hands of his three pursuers. Soldiers know the nature of their business. But death in war is no less painful to those left behind just because it goes with the mission. Roberts, 32, from a suburb of Sacramento, Calif., left a wife and 2-year-old daughter. "He was a great guy," said his sister-in-law Denise Roberts. "His mother said at least she knew he died doing what he loved to do." Valerie Chapman, widow of Air Force Technical Sergeant John Chapman, 36, who lived in Fayetteville, N.C., had the same thought. "You have to love it to do what they do," she said of her husband, who died with Anderson and four others in the fire fight after the Chinook crash-landed. "And he loved his job." 3. Navy SEALS recount time behind Afghan enemy lines For 96 hours they waited undetected for U.S. Marines sleeping under dirt and speak ing only when necessary. Four days before the U. S. Marines touched outside the Taliban stronghold of Kandshar, the SEALs were on the ground there, miles behind enemy lines. Their target was a private airstrip built by a wealthy Arab to reach his hunting lodge. With in two weeks, the world would know it as Camp Rhino, and the Marines there would be helping opposition Afghan forces run the Taliban out of town. The Navy took the unusual step Thursday of having two SEALS who were among the first U.S. troops in Afghanistan speak about the 96 hours they spent outside Kandahar. Their names were withheld, and they declined questions that could compromise security. "I've been in 16 years, and this was like the big game," said the platoon's chief enlisted man. "We're real fortunate to get a tested." The airstrip that would become Camp Rhino was believed to be deserted. The SEAL team, one of three based in Coronado, was sent in to make sure. With each carrying 100 pounds of food, weapons and gear, the SEALs were dropped "a significant distance" from the strip. Between them and their target was a silent, uninhabited landscape of sand and dust. "The only thing you hear is the wind," said a 34-year-old lieu tenant from Iowa, the platoon's No.2 in command. It was an area so isolated they found no land mines even though Afghanistan is one of the most heavily countries in the world. To remain undectedted, they communicated by hand signals and spoke only when necessary and in a close whisper. They left no traces, packing out even their body waste. They moved at night under moonless skies, lighted by a dome of stars. The lieutenant brought along a small thermometer that showed the temperature dropping into the 20's. During the day, they slept out of sight. Dirt covered their bodies. Through night-vision goggles they could see animals that resembled coyotes. During thd days, U.S. jets streaking over head. "It's a cold, desolate place where anything could happen. You have to be prepared for anything," said the top enlisted man, a 35-year old from Ohio. They found the unoccupied and passead the word that all was clear. But as the Marines grappled with the logis tics, for landing, the SEALS' 24- hour mission stretched into 96 hours. Their silence wasn't broken until Nov.25 when the thunder of the CH-53E Super Stallion helicopters announced the arrival of the Marines. For the SEALs pro viding security, this was the most dangerous moment, but the landing went off without a hitch. "I want to thank you guys for freezing for us," the Marines' company commander told them. Hours later, the SEALs were gone, heading back to an unnamed base in the Middle East. Twelve days later, on Dec. 7, the Tailban abandoned Kandahar. The Navy's elite "Sea, Air, Land" force has served as an advance guard for the Marine COrps in nearly every U.S. conflict since its formation in 1962. Its members are trained to handle almost any mission on any terrain, drom deserts to frozen tundra to the high seas. As you have seen on national television and read in the newspapers, Special Operations has suffered causalities in Afghanistan. We are saddened to report SEAL  PO1 Neil Roberts  is one of the men who gave his life in the fight against terrorism. Details of this tragedy are reported in the following article from the Virginian Pilot and the attached article from the New York Times. Neil was a graduate of Class 184 and served in several SEAL Teams. His wife Patty and 18-month-old son, Nathan, currently reside in Virginia Beach where Neil was assigned. A memorial service is schedule for 1400, Monday (11 March 2002) at the Base Chapel NAB Little Creek, Norfolk, Virginia. Uniform for Navy personnel is Service Dress Blue. The family has requested that in lieu of flowers donations be made to the Naval Special Warfare Foundation, P.O. Box 5365, Virginia Beach, VA 23471, or to the Neil Roberts Memorial Fund, Navy Federal Credit Union, Lynnhaven Branch, 509 Viking Drive, Virginia Beach, VA 23452. Condolence should be mailed to Patricia Roberts, 2513 Quail Hollow Place, Virginia Beach, VA 23454. God bless Neil and his family. WASHINGTON -- A Norfolk-based sailor who was part of an elite special warfare unit was among seven Americans killed in what for U.S. forces has been the deadliest battle to date in Afghanistan. Petty Officer 1st Class Neil Christopher Roberts, 32, died after falling from a special forces helicopter as it made an emergency takeoff while under fire late Sunday afternoon, the Pentagon announced. He apparently survived the fall but died after being captured and wounded by terrorist forces on the ground, Marine Maj. Ralph Mills told The Associated Press. Roberts was the first Navy combat death in the Afghan war. A friend from his hometown in California described him to a reporter there as ``a real nice kid -- kind of a tough kid who didn't let things bother him.'' An aviation boatswain's mate, Roberts was a Navy SEAL and part of Special Warfare Group Two, based in Norfolk. The SEALs are considered among the world's toughest fighters and are trained for sea, air and land combat. Roberts was a native of Woodland, Calif., but lived in the Hampton Roads area with his wife and 18-month-old son, a Navy spokeswoman said. His mother and a sister live in California. The family declined all requests for interviews. Roberts apparently was the first casualty of a firefight that began when the MH-47E Chinook helicopter carrying him and other U.S. troops landed in the rugged Gardez area of eastern Afghanistan. NORFOLK, March 8 -- The Navy SEAL who was slain after falling out of his stricken helicopter in Afghanistan wrote his wife an open-in-the-event-of-my-death letter in which he assured her: "I died doing what made me happy." "Although I sacrificed personal freedom and many other things, I got just as much as I gave. My time in the Teams was special," Neil Roberts, 32, wrote. "For all the times I was cold, wet, tired, sore, scared, hungry and angry, I had a blast." Roberts, a Norfolk-based petty officer 1st class from Woodland, Calif., was one of seven Americans who died Monday after U.S. helicopters were hit by enemy gunfire in Afghanistan. Roberts fell to the ground as his helicopter, hit by a rocket-propelled grenade, veered away. He apparently survived the fall and was shot on the ground. The U.S. military encourages members to update their wills and otherwise put personal affairs in order before they leave on assignment. The Roberts family is grieving in private, but friend Christina Kalassay released a portion of the letter because Patty Roberts wanted to tell people a little bit about her husband, who is the father of her 18-month-old son. "Neil would want everyone to remember him as a loving husband and father, a loving son and brother, a true friend and warrior who never once questioned his commitment to his family or his country," Kalassay said in a statement. Roberts had a twin brother and 10 other siblings. He wrote in his letter that he treasured his childhood and that his family's support and care made him the person he was. He also expressed how much being in the Navy meant to him. "I consider myself blessed with the best things a man could ever hope for," he wrote. "My childhood is something I'll always treasure. My family is the reason I'm the person I am today. They supported and cared for me in the best way possible. . . .
"All the times spent in the company of my teammates was when I felt the closest to the men I had the privilege to work with. I loved being a SEAL. If I died doing something for the Teams, then I died doing what made me happy. Very few people have the luxury of that." nearby and immediately got in a firefight. inserted to recover wounded, KIA. Roberts body recovered as well. where he was shot - he was already dead. men to get the Victoria Cross as a result of the cave fight last fall. incredible, if not more. Stay tuned. A Navy SEAL was killed in southern Afghanistan after stepping on a land mine while conducting a small unit training mission at an abandoned al Qaeda base near the Kandahar airport, defense officials said yesterday. Chief Petty Officer Matthew J. Bourgeois, 35, of Virginia Beach died at 8:30 a.m. yesterday in Afghanistan (11 p.m. Wednesday EST) as he trained with U.S. Special Operations troops at Tarnac farm, an al Qaeda training base abandoned in November, officials said. A second Navy SEAL, not identified, was injured by the mine. Officials said his wounds are not life-threatening. Bourgeois is the 31st U.S. serviceman to die in and around Afghanistan since the war on terrorism began Oct. 7. He was the first killed by a land mine. At least three U.S. servicemen have been injured by mines, one near the Kandahar airport and two at Bagram Air Base, 35 miles north of Kabul. Matthew Bourgeois and his wife, Michelle, had a son seven months ago, said the serviceman's grandfather, Tom Bourgeois of Tallahassee. He said his grandson relished the challenge presented by the SEALs, the Navy's elite Special Operations forces. "He was that kind of guy," Tom Bourgeois said. "He was in number-one condition -- he had to be to be in the SEALs. They kept their boys in top shape." SEAL is short for Sea, Air, Land teams, which were first created as a Navy counterinsurgency force in 1962. Bourgeois's father, Tom Bourgeois Jr., declined to comment yesterday when contacted at his home in Portsmouth, Va., where he and his wife moved two years ago to be closer to their son. Another SEAL based in the Norfolk area, Petty Officer 1st Class Neil C. Roberts, 32, died March 4 after he fell from an MH-47 Chinook helicopter during Operation Anaconda south of Gardez and was apparently captured and executed by al Qaeda fighters. He was the first Navy member to die in combat.